If you're not currently a member, come back to the NEW URNA! This is the kickoff of monthly URNA Newsletters to help us better stay in contact with you! This mailing is addressed to: Current and Former Members of URNA, Volunteers. Feel free to forward to anyone! 2. Welcome Gordie Jacobs who will transition to lead the URNA Board! Gordie has completely upgraded and enhanced our website and newsletters, met with SC3 and started coordination with other new volunteers for membership push. 3. Other New Stuff: Our new URNA website/newletter will help provide communication with the community and attract new members. We are coordinating with the SC3 Security Patrol services and looking to both enhance and change up hours of the patrol cars. We are lucky to have a GREAT new Security Patrol Officer (Alex Smith) driving our routes now and we hope that you get to know him as well. We are excited to announce new rates for members! The biggest obstacle to getting the most out of our patrol services is membership! We NEED MORE OF OUR NEIGHBORS to participate. More members = more hours of patrol service = more safety for our area! We hope these rates will be attractive. For full information about what features are included, please visit the website and see JOIN NOW! **Rates are for new members and renewals after Dec 1. CHECK OUT our new redesigned Website with many helpful tips and full information about URNA activities and Membership! SAFETY TIPS/FAQS/NEWS ITEMS/OUR MISSION/& More! New Membership Options: Please forward this newsletter to neighbors and anyone who might be interested. 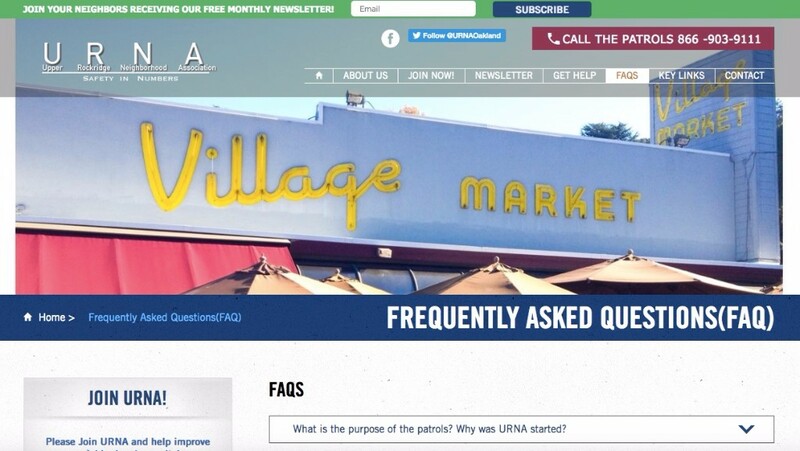 Check our new website for the URNA Patrol Coverage Map and Membership info. Hours/Funding Update: We are working with SC3 currently to add a weekend day and alternate hours on different days... Patrol hours are sent to members only. Please JOIN so we can expand hours! Volunteers/Board Members: We are always looking for one or two new board members, and someone to help with community education and outreach. Please contact us if interested. You are also welcome to attend a board meeting at any time. New Membership drive starts this month. Holiday Packages Delivery? Watch out! WINTER MEMBERSHIP DRIVE: We are meeting with new volunteers to coordinate a NEW MEMBER DRIVE this month. 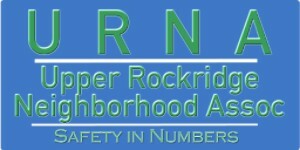 That includes printed door hangers, advertising, handing out flyers at Rockridge NPCP meetings, Village Market, SC3 Patrol introductions, etc. Your ideas welcome! We ALL benefit from a stronger URNA! Please encourage neighbors to give us a look! The Upper Rockridge Neighborhood Association is a California nonprofit unincorporated association formed in the Fall of 2014, and is not organized for the private gain of any person. The Association is organized exclusively as a social welfare organization within the meaning of Section 501(c)(4) of the Internal Revenue Code. See Website for List of Board Members. SC3 Patrol officers are unarmed and do not use racial profiling. They are trained to observe and report suspicious or criminal activity. Their first response to any criminal or safety concern is to contact OPD, and then observe, report, and, when it is safe to do so, assist anyone in need. IN CASE OF EMERGENCY OR URGENT SITUATION, ALWAYS CALL 9-1-1 (from landlines) OR THE OPD EMERGENCY LINE (510) 777-3211 (from cell phones) FIRST.